More than 50% of students in the TDSB speak a language other than English at home. While some English language learners are new to Canada, others start learning English when they begin school. 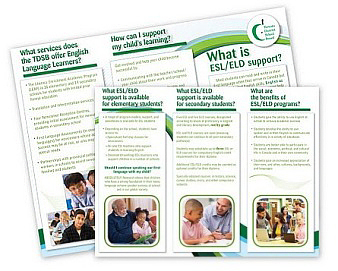 We offer a variety of programs and services for English Language Learners and all TDSB elementary schools provide English as a Second Language (ESL) and English Language Development (ELD) programming. Most students can read and write in their first language when they arrive in Canada but may have limited English skills. English as a Second Language (ESL) and English Language Development (ELD) programs help students learn English so they can participate fully in the curriculum and school life with their English-speaking classmates. English as a Second Language (ESL) programs are for students who have had age-appropriate schooling in their home country. English Language Development (ELD) programs are for students who have had limited prior schooling and have the opportunity to develop age-appropriate skills in any language. LEAP (Literacy Enrichment Academic Program) is a special program for students aged 11- 18 who did not have the opportunity to attend school regularly before arriving in Canada. LEAP offers these students a chance to gain English language, literacy, and mathematics skills so that they can participate fully in their classes. LEAP is offered in 40 elementary schools and 13 secondary schools. Application to a LEAP class is made through the student's home school.